Do Perfect Rosters Even Exist? Posted by Chris Fordyce. Mar 21, 2019. It can be quite challenging and time-consuming playing around with rosters and keeping staff happy. As a manager or business owner, finding the right balance between business needs and staff availability can be tricky to meet. Lucky for you, RosterElf has developed a perfect match system and includes the ability to request shift swaps. Staff have the freedom and access to update their ongoing weekly availabilities and days off request straight from their smartphone. For managers who are publishing their weekly rosters, this is important as our perfect match algorithm will find the best available and qualified staff to work a certain shift for your business. This makes it easier for managers who can feel confident they have the best staff on for each shift. Managers can choose to copy this week's roster for the following week if they were happy with the performance of each employee. Shift swaps allow managers to make small adjustments to published rosters. We recommend the staff update their availabilities for their manager each week and as they come. This way, managers can publish rosters in advance and make small adjustments if need be. For example, a staff member is available for next Monday’s shift and you have rostered them on. The staff might have forgotten they have a school exam and can’t work next Monday. Staff can then request a shift swap in the ‘My Shifts’ tab on both the web version or smartphone app. Managers receive an email stating a staff has requested a shift swap and that RosterElf is looking for a replacement for you. RosterElf sends out a replacement shift to equally qualified and available staff to cover this shift. The request gets emailed and staff can accept it. Whichever staff sees and actions the email first will get the extra shift. The perfect match algorithm is a helpful guidance tool in publishing rosters and creating shifts for staff based on their availability. 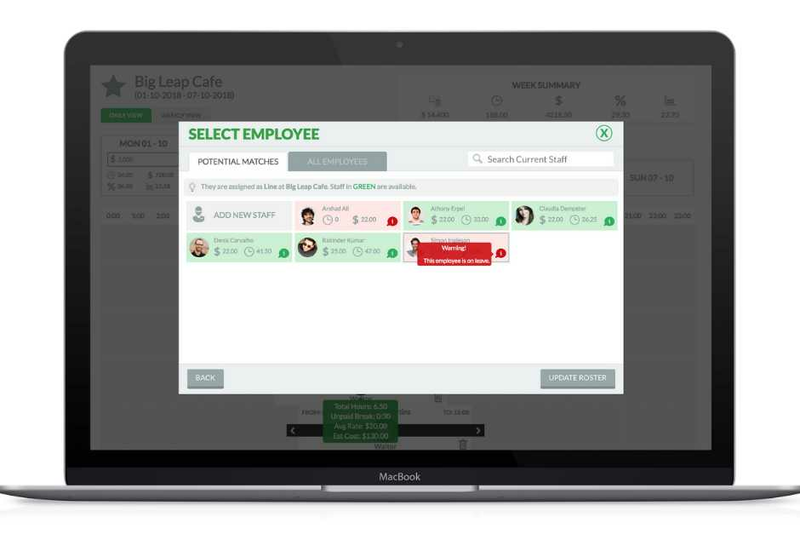 Shift swap requests will help self-serve your business and allow staff to organise shifts between them. This helps ensure every shift is covered, regardless of short notices. Not every roster you build will be perfect, there are changes to your business that is out of your control. But building a strong roster template to use and make adjustments to is crucial. It is important as a business owner or manager to keep up with changes in your business and make quick decisions to shifts that won't hinder your overall business performance.